Sunday October 9th 1881. I helped a little about the work this morning and went up stairs to rest and read for I felt terribly stupid. Will came up there and we talked till noon. In the afternoon him and I went up to Shurts. Stopped at the old place to get Clara. We put in the afternoon, did not get home till supper was ready. Will took the horse down town and I put in part of the evening writing in this book. 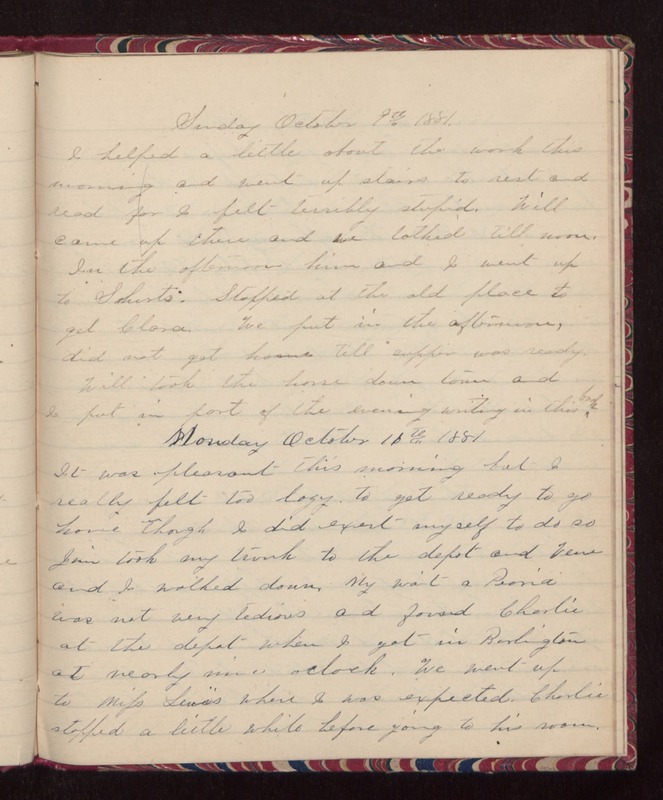 Monday October 10th 1881 It was pleasant this morning but I really felt too lazy to get ready to go home though I did exert myself to do so. Jim took my trunk to the depot and Vene and I walked down. My wait a Peoria was not very tedious and found Charlie at the depot when I got in Burlington at nearly nine oclock. We went up to Miss Lewis where I was expected. Charlie stopped a little while before going to his room.